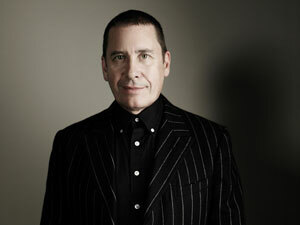 Jools Holland, OBE, was born Julian Miles Holland on January 24, 1958 in Blackheath, South East London. At the age of 15, Jools was introduced to Glenn Tilbrook and Chris Difford; together they formed Squeeze, and shortly afterwards they were joined by Gilson Lavis (who had already played with, among others, B. B. King, Chuck Berry and Max Wall) who still drums with Jools. In 1987, Jools formed The Jools Holland Big Band comprising himself and Gilson Lavis. This has gradually metamorphosed into the current 20-piece Jools Holland and His Rhythm & Blues Orchestra, which consists of pianist, organist, drummer, three female vocals, guitar, bass guitar, two tenor saxophones, two alto saxophones, baritone saxophone, three trumpets, and four trombones. As well as formidable live performances, Jools has maintained a prolific recording career since signing to Warner Music in 1996, which includes the multimillion selling Jools Holland and Friends series. Notable 'friends' have included Sting, Chrissie Hynde, George Harrison, Norah Jones, Eric Clapton, David Gilmour, Bono, Joe Strummer, KT Tunstall, Robert Plant, Smokey Robinson, Ringo Starr, Peter Gabriel, Solomon Burke and many more. Jools is a big fan of the cult 1960's TV show The Prisoner, and his inspiration for Helicon Mountain, the studio complex he designed and built, was Portmeirion, the setting for the series. Jools demonstrated his love of the series by starring in a spoof documentary, The Laughing Prisoner, with Stephen Fry, Terence Alexander and Hugh Laurie, in 1993. In two subsequent documentaries Walking to New Orleans in 1985 and Mr Roadrunner in 1991 Jools unearthed some of the roots of American music, which led him to talk to (and play with) many of his heroes, including Fats Domino, Dr. John, and Lee Dorsey. In 1988, Jools wrote a six-part series with Rowland Rivron, The Groovy Fellas, about a Martian visiting Earth. After presenting two series of Juke Box Jury in 1989 and then 26 shows of The Happening in 1990, Jools was asked in 1992 to host a new music programme for BBC2, which combined his talent and experience as a musician with his skills as a TV presenter. This was Later...with Jools Holland. The show has reawakened the innovative spirit of The Tube, and is in its 41st series and 20th year . Other television programmes include Name That Tune; Don't Forget Your Toothbrush; Beat Route; Jools Meets The Saint; Jools' History Of The Piano and, this year, London Calling. Jools also conducted the interviews for the definitive Beatles Anthology and the Rolling Stones Biography. He also appeared in the 1997 film Spice World as a 'Musical Director' and, on 31st December 1999, performed at the New Year's Eve Millennium Dome opening ceremony in the presence of Her Majesty The Queen, HRH The Duke of Edinburgh and various luminaries. The 2004 UK tour kicked off with a star-studded concert at the historic Royal Albert Hall, donating all proceeds to the Teenage Cancer Trust. Later that year, he collaborated with Tom Jones on an album of traditional R&B music, Tom Jones & Jools Holland. The album, which was recorded at Jools' Helicon Mountain studio with Laurie Latham, entered the UK Album Charts at Number 5. In March 2007, Jools played two very special charity concerts, at Wells Cathedral and Rochester Cathedral, to raise funds for the upkeep of cathedrals throughout the British Isles and highlight the beauty of these historic buildings and the music within them. At the heart of these charity concerts was a new setting of the Mass, commissioned by the Bishop of Bath and Wells and composed by Jools. The new Mass was performed exclusively in the two cathedrals. Jools' colourful autobiography, Barefaced Lies & Boogie-Woogie Boasts, hit the shelves on October 4, 2007 (published by Michael Joseph Ltd.); the paperback was published in the summer of 2008. One of Jools personal 2010 highlights was the Sony Radio Academy Silver Award for Best Specialist Music Programme presented to his highly-acclaimed and eclectic BBC Radio 2. That year saw an even more prestigious achievement: the Sony Gold award for Music Broadcaster Of The Year. The show has been running for 12 years, with a new series underway, on Monday nights. He also took on the very challenging role of Music Curator for Prince Charles September 2010 green initiative START, a festival in the heart of London to raise awareness on all environmental issues. Jools graced the event with a special performance. On 15th November of the same year Rhino UK released Rockinghorse, a 19-track collection of classic Jools Holland compositions, interpretations and covers, followed in June 2011 by Finding The Keys: The Best Of Jools Holland, comprising 20 songs, all personally selected by Jools himself. Jools also had the privilege of being part of the stellar line-up at the Queen's Diamond Jubilee concert, set against the spectacular backdrop of Buckingham Palace, on June 4th. A brand new studio album with the Rhythm & Blues Orchestra and hosting some very special guests, is scheduled for 3rd December. The Golden Age Of Song is a collection of brand new recordings of classic songs and 5 live recordings from the BBC 2 TV Show Jools Annual Hootenanny. It features the extraordinary talents of Amy Winehouse, Jessie J, Cee Lo Green, Florence Welch, Paul Weller, Paloma Faith, Lily Rose Cooper, Tom Jones, Rumer, James Morrison, Paolo Nutini, Joss Stone, Mick Hucknall, Caro Emerald, Ruby Turner and Gregory Porter. As always, Jools continues to dazzle audiences across the UK with his Rhythm & Blues Orchestra and their exuberant live performances.